I am always taking pictures! Little glimpses of life and its most wondrous daily events. Most of these pictures never make it to the blog though. Some of them are great, but don’t warrant a whole blog post built around them. So, they just languish in my phone/computer memory. Sometimes, as I flick through the thousands of photos, I have amassed, I come across a picture that really provokes a reaction in me. And I want to show it to the world and tell its story, no matter how quotidian it may be. So, here is the start of a new photo series on my blog – My Week in Pictures! Every Friday, I will be posting a selection of photos from the past seven days. Photos capturing some wonderful and curious moments that I want to commit to memory and think about some more. 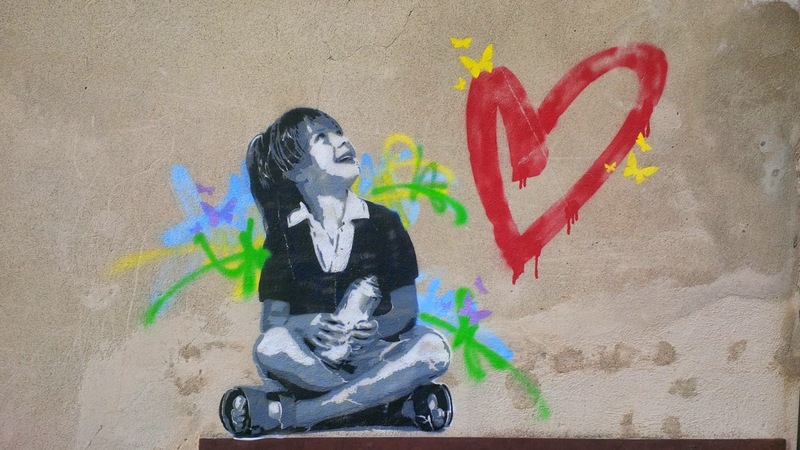 Grafitti in Italy are usually so unappealing that I can’t feel nothing but anger when I see them detracting from the beauty of Italian buildings and urban landscapes. Ugly shapeless lettering quickly smeared on a wall that could easily be several centuries old irritates me so much, that when I see a beautiful grafitti, I admire it as a rare gem. Like this one, that I came across in Arqua Petrarca. Isn’t it lovely? It certainly makes my heart smile! The artist is alessio-b.com. 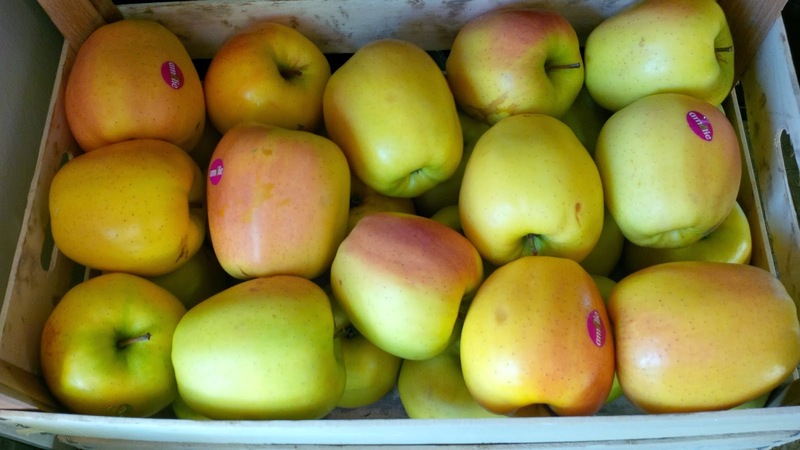 One of the things I love about living in Italy is the ability to buy a whole crate of gorgeous fruit for under ten euro! Yes, that’s right! The crate is close to 10 kilos, too. It takes us about a week to go through it. So, when I told you that fruit at home disappears by the crateload, I wasn’t joking. 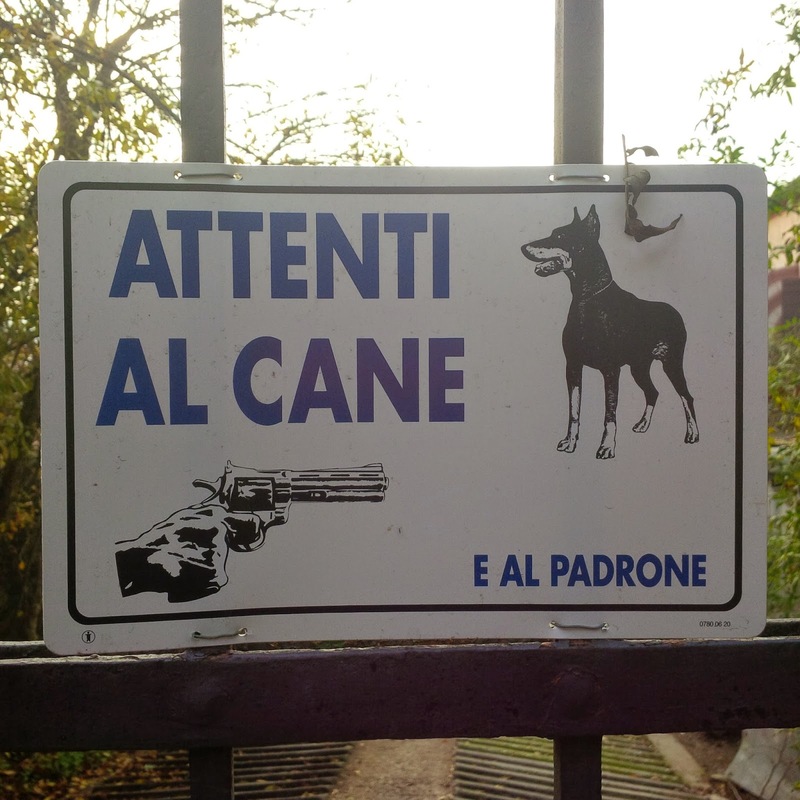 I saw this sign attached to the gate of a house in Arqua Petrarca and it literally says: Beware of the dog… and the master! The clip-art is self-explanatory, I think. I don’t know if the sign was put up as a joke or not, I didn’t dare find out. Meat is such a techy subject. I think we have become so desenitised to it that sometimes we forget it comes from real living creatures. We just get it all nicely and hygienically packed, it’s easy not to think where it comes from. 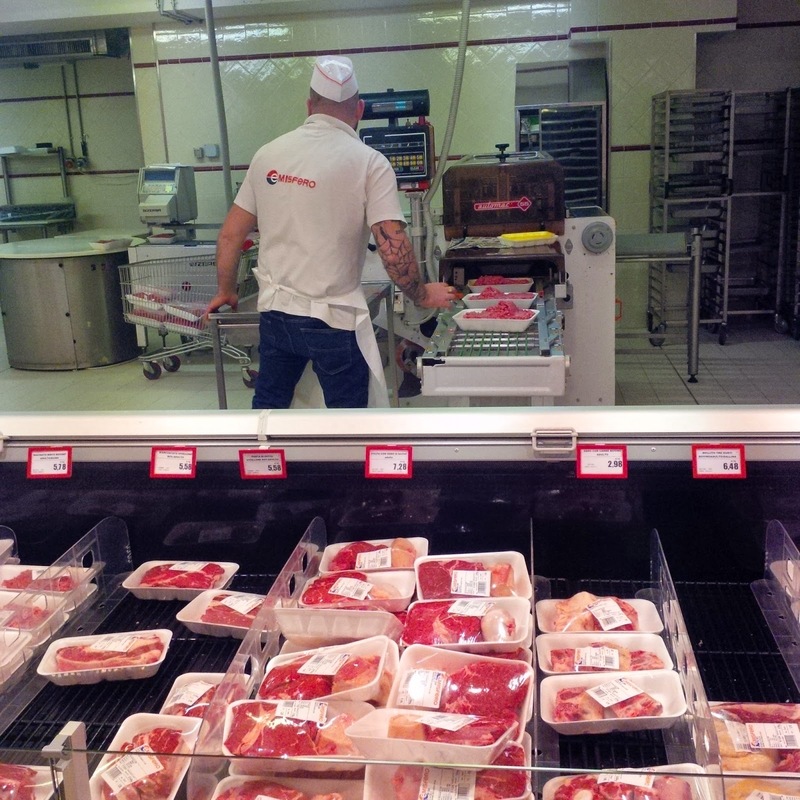 I observed this butcher at one of the largest supermarkets in Vicenza. He wheeled out a huge number of packs with minced meat and started putting them through the cling film wrapping machine. It was all so raw and red at one end and so safe to touch on the other. Do I eat meat? Yes, I do. How do I feel about it? Definitely desenitised. Oil for me is oil. It’s oily and it does the job! Not so much in Italy. They have hundreds of varieties and even organise oil tastings! In fact, I am to go to one tomorrow at the Taste of Christmas event in Verona. 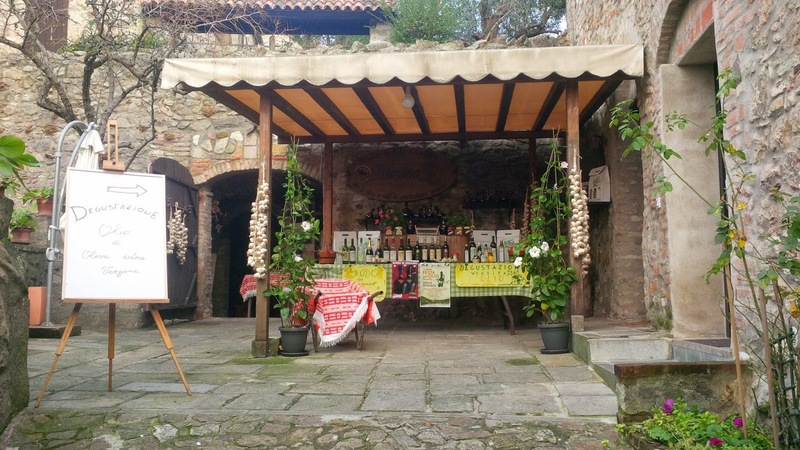 This picture was taken in Arqua Petrarca though. A local shop there offers a number of oils to be tasted and, if found satisfactory, then bought. Unfortunately, we passed by it during the hours of afternoon reposo, when all business ceases, so it was closed. I put my phone through the bars of the fence in order to get an unobstructed picture. 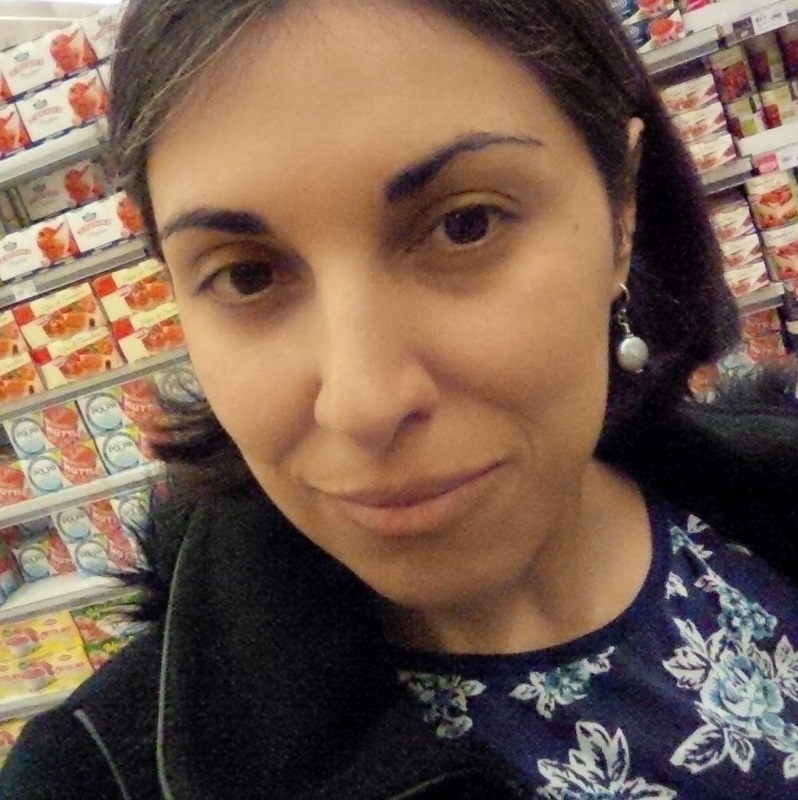 That’s me trying to take a selfie during our weekly shop. I am working on a blog post about jewellery and how it fits in our environment. I was trying to photograph clearly the earrings I was wearing. After taking numerous selfies, the blog post has been shelved for now. Let me tell you, selfie-taking is not easy. You also feel quite stupid when people pass by and either stare at you or studiously ignore you. 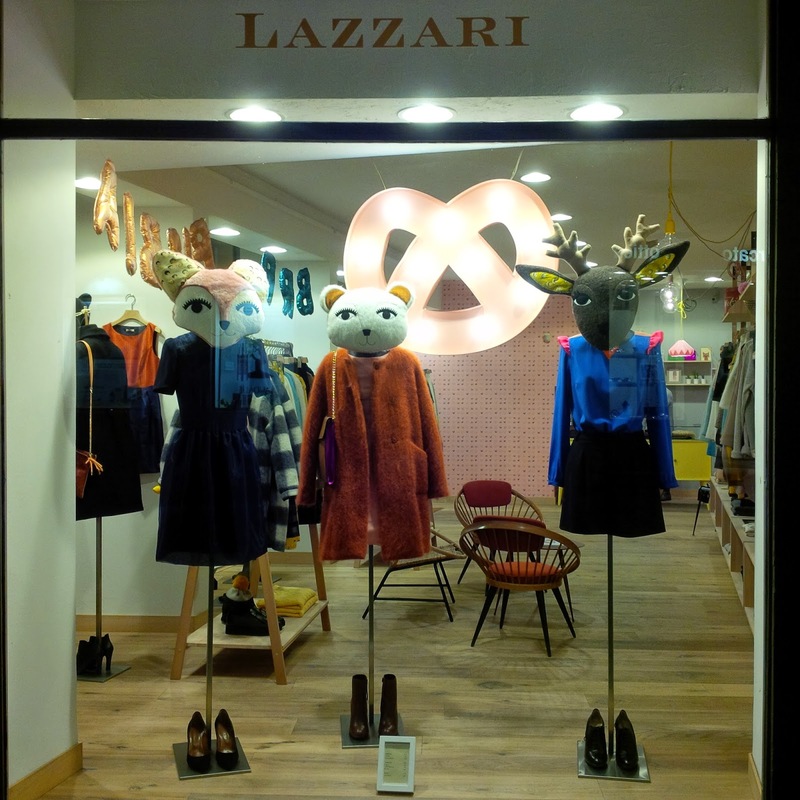 This is a cute fashion shop in Vicenza. I always like their displays. Once they had a jumper with a fried egg knitted on the front. I don’t think they carry anything in my size, all the clothes look tiny, still I like their style. So, here goes! My week in pictures 1. I hope you enjoyed looking through my random photos and reading the short story under each one of them. Do let me know your thoughts in a comment below or by connecting with me on social media (my accounts are at the top of the page).